Source: Civil War Pension Index Card of Ethan A. Westbrook. Organization Index to Pension Files of Veterans Who Served Between 1861 and 1900. National Archives and Records Administration. Publication T289. Digital image purchased at Footnote [http://www.footnote.com/]. Enlisted: 10 October 1851 in Pavillion Twp., Kalamazoo Co., Michigan; private. Enlisted in Co. E, 13th Michigan Infantry on 17 January 1862. Promoted to full corporal on 1 November 1864. Biography or Information of Interest: Named for Vermont's Revolutionary War hero, Ethan Allen WESTBROOK was written up in a Newaygo County history of early pioneers, which can be read here. 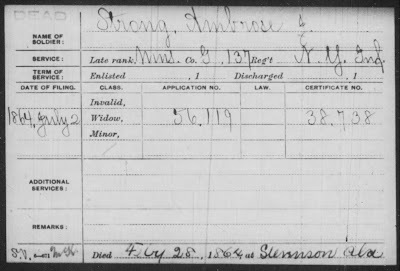 Enlisted: 7 August 1862 at Ann Arbor, Washtenaw Co., Michigan; private. 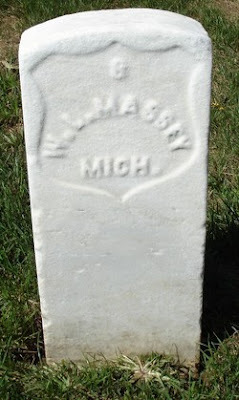 Enlisted in Co. H, 20th Michigan Infantry on 19 August 1862. Mustered Out: 30 May 1865 at Delaney House, Washington, D.C. 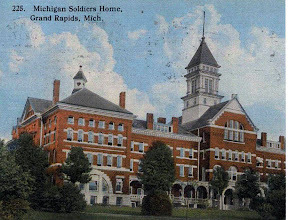 Source: Michigan Soldiers Home, Grand Rapids, Kent Co., Michigan. Postcard. 1915. Digital image accessed at Kent Co., Michigan GenWeb site [http://kent.migenweb.net/veterans/index.html] 26 May 2008. Biography or Information of Interest: It's taken me a while to post this sketch, because I'm just not sure about the details of George's life. 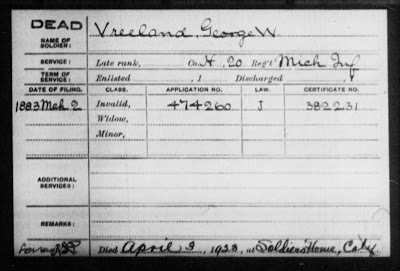 There are an amazing number of George W. Vreelands of the same age that lived in Michigan (even in Washtenaw County!) at the same time as "my" George. Sorting them out has been a challenge. I've used census records that lead me to believe George never married or had children (but I'm not 100% confident of this theory!). He lives as a single man at his parents', and later his married sister's, homes until 1910, when it appears he lived in the Veterans (Soldiers) Home in Grand Rapids, Kent Co., Michigan. He seems to have lived in the Veterans Home in Los Angeles Co., California after 1920. 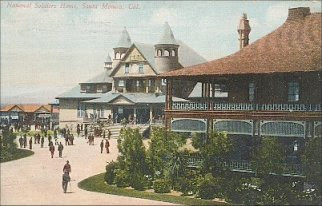 Source: National (Sawtelle) Soldiers Home, Santa Monica, Los Angeles Co., California. Postcard. Date unknown. Digital image accessed at Los Angeles Co., California GenWeb site [http://www.cagenweb.com/re/losangeles/photos.htm] 26 May 2008. To commemorate the NARA-Ancestry.com agreement on the eve of Memorial Day, Ancestry.com is making its entire U.S. Military Collection -- the largest online collection of American military records -- available for free to the public. From May 20 through May 31, people can log on to http://www.ancestry.com/military to view more than 100 million names and 700 titles and databases of military records, the majority of which come from NARA, from all 50 U.S. states. Ancestry is also offering a free download in .pdf format of the 79-page book Military Collections at Ancestry.com by Esther Yu Sumner. Not only does it discuss the various collections found on the website, but it gives a short, detailed history of each war or conflict in chronological order. Even if you don't have an Ancestry subscription, this book is well worth reading. Click here to download. Lindon, UT May 22, 2008 - In commemoration of Memorial Day, Footnote.com today announced their entire collection of military photos will be made permanently free on the site. The collection features over 80,000 photos from WWII and Vietnam making it the largest collection of its kind on the web. Through their partnership with the National Archives and Records Administration (NARA), Footnote.com has digitized and indexed the photos, which include images of downed aircraft, aerial photos of bombings, fighter groups and combat photos. What makes the photos unique are the short captions included with the photos, which provide interesting details about the events and people featured. To view these photos click here. The announcement follows closely behind Footnote.com's recent release of an interactive version of the Vietnam War Memorial. The online memorial is one of the largest images on the web and features a full-size photo of the memorial in Washington, DC. Visitors to the interactive memorial can search for names of fallen veterans, connect with other people, and create tributes by adding their own photos and stories to the site. To view the Vietnam War Memorial, go to www.footnote.com/thewall/. "City Directories for: Boston, Chicago, New York City, Philadelphia, and Washington DC. They have also added the 1860 Federal Census. "So what?" you say. "A lot of subscription websites have the 1860 Federal Census." This is different. This one is interactive. In other words, let's say you find your 3rd-great-grandfather on the 1860 census. You can leave an annotation on his record, and maybe another descendant of his will come along and find it when they search for his name. Voila! You've connected with another cousin and can exchange research! This is in the subscription area, only. "Also, I saw some news that they are going to start adding the Civil War Pension Files (they already have the index cards online). You know, those records that cost $75 a piece to order from the National Archives? Isn't this exciting? "Don't have a subscription to Footnote, yet? You can 1) go to your local Family History Center and use their free subscription, or 2) Footnote is offering a 20% discount to their annual subscription through affiliates (like myself) only. To take advantage of this offer, click on this link. * West Virginia Marriages, 1853 - 1970"
Source: Signature of Jacob F. Toliver from Compiled Service Record of Jacob F. Toliver. Compiled Service Records of Confederate Soldiers Who Served in Organizations from the State of North Carolina. National Archives and Records Administration. Publication M270. Digital image purchased at Footnote [http://www.footnote.com/]. Married: first to Matilda HIGGINS (1829 - 1906)--my husband's ancestor--on 1 October 1851 in Ashe Co., North Carolina; divorced. Married second to Caroline CHEEK (1849 - 1927) on 4 April 1882, probably in Allegheny Co., North Carolina. Children: with wife Matilda, Jacob had five children: Amanda Phidella (1853 - 1918); Rose Phidella (1857 - 1919); Clark Pleasant R. (1861 - 1918) - my husband's ancestor; Solomon (1864 - 1950); and John Huston TOLLIVER (1867 - 1949). With wife Caroline, he had one son, Clayton TOLLIVER (1884 - 1952). During his children's generation, another "L" was added to the surname, originally spelled TALIAFERRO. Compiled Service Record Jacket of Jacob F. Toliver. 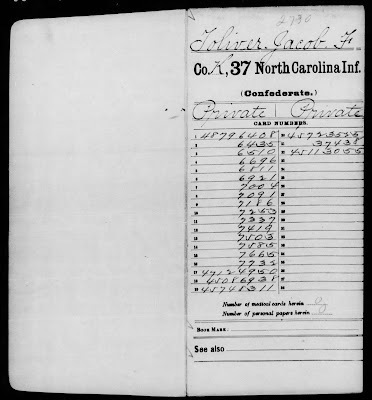 Compiled Service Records of Confederate Soldiers Who Served in Organizations from the State of North Carolina. National Archives and Records Administration. Publication M270. Digital image purchased at Footnote [http://www.footnote.com/]. Enlisted: 15 September 1861 in Co. K ("Alleghany Tigers"), 37th North Carolina Infantry at Alleghany Co., North Carolina; private. 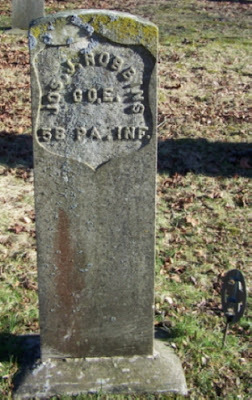 Promoted to Full Private (Reduced to rank; Estimated day) on 30 March 1863. Discharged: Absent without leave on 28 January 1865. 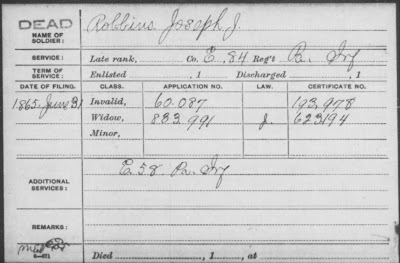 Biography or Information of Interest: Jacob's compiled service record consisted of 23 images at Footnote, plus a couple of cross-reference cards. The reason it is so long was his "interesting" career in the military, which began15 September 1861, when he first enlisted as a private in Company K (also known as the "Alleghany Tigers") of the 137th North Carolina Infantry in the Confederate Army. His compiled service record contained a brief description (five foot, six inches tall; 30 years old) and his signature. On November 20th of that year, he mustered in at Camp Fisher, promising to serve for one year. On the January/February 1862 Muster Roll, he was listed as a drummer, although his record states he was not promoted to Full Musician until March 1st, and then promoted again to Full Musician on March 30th. On April 3rd, he re-enlisted for the duration of the war, at Kinston, Lenoir Co., North Carolina. Less than a month later, he was listed as a deserter, having taken off from Kinston on May 2nd. For eight long months, he remained away from his company. On 9 January 1864 at Liberty Mills (Virginia?) he returned to his unit. I don't have his full military record, so I don't know if he received a court martial for his offense, but I can't imagine that he got away without some sort of consequence! He served with his unit until he was captured by the Union Army on May 6, 1864 during the Battle of the Wilderness in Spotsylvania Co., Virginia. He ended up a prisoner of war at Point Lookout, Saint Mary's Co., Maryland, arriving there May 17th from Belle Plains, Virginia. On July 23rd, he was transferred to Elmira Prison in Elmira, Chemung Co., New York, where he remained a prisoner until he was transferred for exchange on October 11th. On 15 November 1864, Jacob and 3,022 other Confederate POWs, including four citizens, four surgeons, and 74 officers, were exchanged at the Federal battery at Venus Point along the Savannah River in Georgia. Apparently, all that was not adventure enough for Jacob, or perhaps he thought he had had enough of war. On 28 January 1865, he was reported as absent without leave from his company, and evidently never returned before the war ended on April 9th. Died: 22 July 1898, probably in Allegheny Co., North Carolina, although it is possible that he removed to Battle Creek, Madison Co., Nebraska in the mid-1880s with some of his adult children. Enlisted: 9 August 1862 at the Town of Candor, Tioga Co., New York; private. Enlisted 11 August 1862 in Co. B, 109th New York Infantry. Biography or Information of Interest: Herman enlisted nine days before his older brother Ambrose and George enlisted in the 137th New York Infantry with Charles ROCKWELL. In Herman's company was Rufus ROCKWELL, Charles' younger brother. 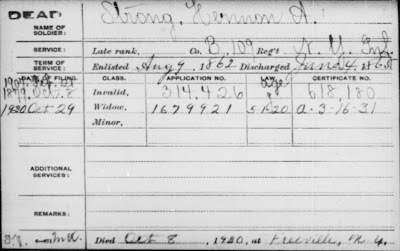 The younger brother of Ambrose, George and Herman (Charles STRONG) would eventually marry the sister of Charles and Rufus ROCKWELL (Ann), and that couple would become my 2nd-great-grandparents. Herman was the only one of the three STRONG boys that came back from the war. His father, it seemed, never recovered, and died six years later. Enlisted: 18 August 1862 at Caroline, Tompkins Co., New York; private. Enlisted 23 August 1862 in Co. G, 137th New York Infantry. Discharged: Died of wounds on 8 July 1863 at Gettysburg, Pennsylvania. 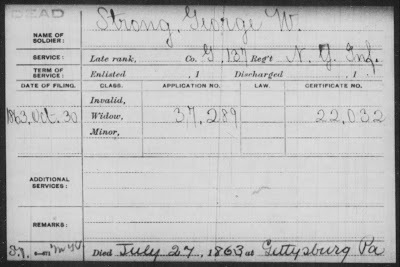 Biography or Information of Interest: On 18 August 1862, George and his older brother Ambrose enlisted together in Company G of the 137th New York Infantry. Only nine days, earlier, brother Herman joined Company B of the 109th New York Infantry. 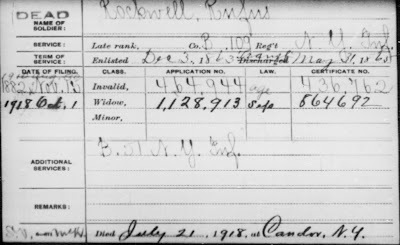 One day later (19 August), Charles H. ROCKWELL joined the same company as George and Ambrose. Charles' sister Ann and George and Ambrose's younger half-brother Charles STRONG would marry eleven years later, and become my 2nd-great-grandparents. Ambrose was a musician; George an infantryman. Together they served in the company until George was killed at Gettysburg. Ambrose died of disease in Alabama a mere seven months later. I had no idea that George had married until I saw his pension index card and noticed that a pension application had been made by his widow. Not having access to his actual pension file, I don't have further information on her or any possible children (not likely, as no pension application for a dependent minor was made). 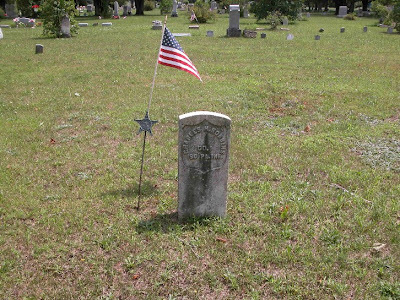 Biography or Information of Interest: Ambrose was one of three sons who served in the Union Army, and tragically, one of two of those who died during the war. I doubt his father ever recovered. In fact, Zeri died at only age 64, six years after the close of the war. Enlisted: 3 December 1863 at the Town of Candor, Tioga Co., New York; private. Enlisted 30 December 1863 in Co. B, 109th New York Infantry. Transferred 31 May 1865 into Co. B, 51st New York Infantry; private. Biography or Information of Interest: Here is another brother of an ancestor I know little about. Rufus was a popular first name for men in the Rockwell family. 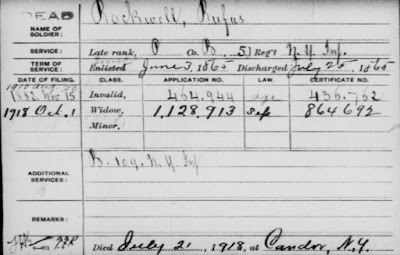 This Rufus had an uncle and a grandfather by the same name. Enlisted: 19 August 1862 at Caroline, New York; private. Enlisted in Co. G, 137th New York Infantry on 23 August 1862. Biography or Information of Interest: I know sadly too little about Charles, or for that matter, most of his family. Information was not handed down orally because his sister, my ancestor Ann, died when her children were young. It appears that Charles may have died as a result of war-related injuries or illnesses, since his date of death is so soon after the close of the war. 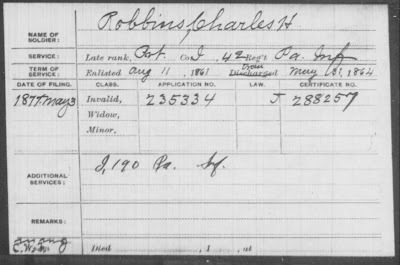 Source: Civil War Pension Index Card of Benson Robbins. Organization Index to Pension Files of Veterans Who Served Between 1861 and 1900. National Archives and Records Administration. Publication T289. Digital image purchased at Footnote [http://www.footnote.com/]. Biography or Information of Interest: In the 1860 Federal Census in Liberty Twp., McKean Co., Pennsylvania, Benson's name appears as "Uzza B. Robbins." 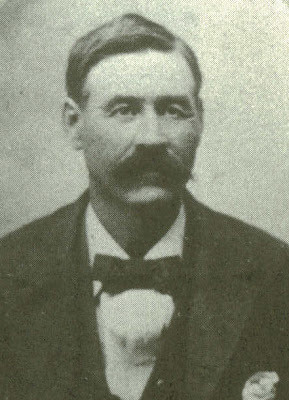 Uzza Robbins was Benson's maternal grandfather, who was hanged in 1850 in Smethport, McKean Co., Pennsylvania for his conviction of murder of his second wife and attempted murder of his adult step-daughter. It was also discovered he had murdered his adult son, as well. 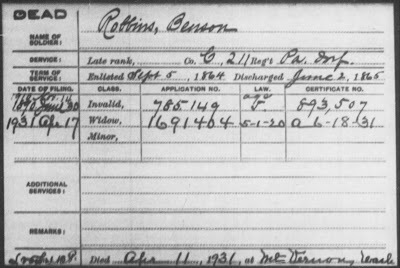 This is the only time Benson's name is listed as Uzza, so my theory is that he or his family changed his name to Joseph Benson Robbins, so as to no longer honor the grandfather who had been convicted of murder. Benson was one of two brothers as well as a son of a man who served in Pennsylvania Infantries during the Civil War. My grandfather told me that Benson had lived in a soldiers' home in Washington and had been buried in Arlington. Naturally, I thought he lived in a soldiers' home in Washington, DC and had been buried in Arlington National Cemetery. In fact, Grandpa may have thought so, himself. About 10 years ago, as I was researching this family, I discovered that Benson and his brother Lee had migrated west to Washington State. Lee actually lived for a time in Stevens County in Northeast Washington, the same county where my parents now reside, and died there as well. Benson and his wife Margaret lived in the Washington Veterans Home in Retsil, Kitsap Co., Washington on the west side of the state. Both Benson and Lee are buried in Arlington Cemetery, Arlington, Snohomish Co., Washington. 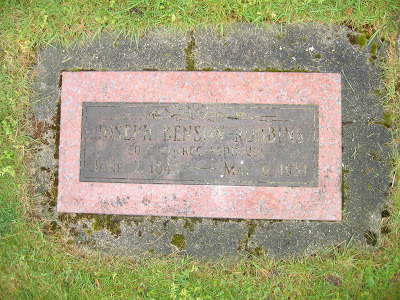 Source: Headstone of Joseph Benson Robbins, Harwood (Arlington) Cemetery, Arlington, Snohomish Co., Washington. Digital photograph taken at the request of Miriam Robbins Midkiff by Lisa Morris, RAOGK volunteer. 2005. In the past week, two favorite carnivals by two geneablogging friends have been posted. My apologies to footnoteMaven for not highlighting her brand new "I Smile for the Camera" Carnival when it first was published last Sunday, May 11th. If you haven't heard, the Maven has a new blog, Shades of the Departed, in which she merges her love of genealogy, history and photography. In the "Smile" carnival, she invites other bloggers to share their personal photos centered around a specific theme. In honor of Mother's Day, her first edition of the carnival had the theme "Mother Love" or "Love of Mother." My submission is here. Deadline for the submission is midnight, 10 June 2008. You can submit your post here. Yesterday, Jasia of Creative Gene published the 48th Carnival of Genealogy, whose topic was "Mom, How'd You Get So Smart?" In honor of Mother's Day and National Teacher Month, bloggers explored their mother's education, whether formal or informal. Twenty-three bloggers wrote 25 posts about their mothers, mothers-in-law, or as in my case, I invited my mother to write her own educational memories. The topic for the next edition of the Carnival of Genealogy will be: Swimsuit Edition! Why should Sports Illustrated have all the fun? This is your chance to show off the bathing beauties in your family. Pull out the old photos of Grandma Moses in her seaside bloomers, Auntie Mae in her pin-up girl suit from the 1940s or 50s, cousin Paula in her psychedelic bikini from the 1970s, or even yourself in your Speedo! Let's have some fun here! Memorial Weekend is knocking on the door and that means the start of the summer sun, sand, and seaside season so let's get in the mood with summer fun photos. What? You don't have any swimsuit photos you dare to share? No problem! Tell us your best family beach stories instead! The deadline for submissions is June 1st. Thanks to the members of the ScanFest crew who suggested the Swimsuit Edition topic! Married: first to Emeline C. [--?--] before 11 June 1841 (her death date), place unknown (possibly Chatauqua Co., New York - her death place). Married second to my ancestor, Marinda ROBBINS (1827 - 1912), daughter of Uzza ROBBINS, on 15 January 1842 in Elkland, Tioga Co., Pennsylvania. It is not known if Joseph and Marinda were cousins. 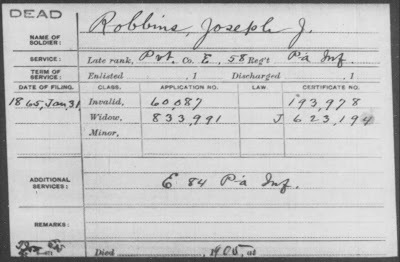 Source: Civil War Pension Index Cards of Joseph J. Robbins. Organization Index to Pension Files of Veterans Who Served Between 1861 and 1900. National Archives and Records Administration. Publication T289. Digital images purchased at Footnote [http://www.footnote.com/]. Enlisted: September 1861 with 84th Pennsylvania Infantry, which was later consolidated with the 58th (he served in Co. E). For a while, he was detached with the 7th Massachusetts Battery. He enlisted 16 August 1862 in Co. G, 135th Pennsylvania Infantry; private. Biography or Information of Interest: Joseph was written up in the History of Manistee, Mason, and Oceana [Michigan] Counties, which can be read here. I also wrote the post, "The Legend of Joseph Josiah ROBBINS" for the 31st Carnival of Genealogy. During his service, Joseph endured a sunstroke, which caused his eventual blindness. In honor of my husband's and children's Norwegian ancestry, Happy Syttende Mai (sit-TEN-day MY)! Fellow Washington State geneablogger Chery of Nordic Blue has a post about the significance of Syytende Mai. I always enjoy reading Chery's blog to gain an understanding of the culture of Norwegian immigrants in the United States' Midwest in the 19th century. Source: Robbins, Viola Gertrude (Peck) and Charles H. Digital scan of original photograph; believed to be their wedding portrait. C. 1864. Original in the possession of Joyce Robbins Sanders, San Antonio, Texas. 2007. 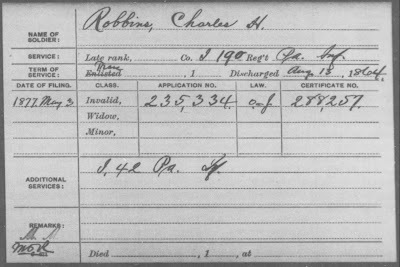 Source: Civil War Pension Index Cards of Charles H. Robbins. Organization Index to Pension Files of Veterans Who Served Between 1861 and 1900. National Archives and Records Administration. Publication T289. Digital images purchased at Footnote [http://www.footnote.com/]. Biography or Information of Interest: Charles' interesting AnceStory (biography) is listed here on my website. The Next Scanfest is in Two Days! This time of year everything speeds up. It's part and parcel for school district employees as well as parents of school-age children and teens. I happen to fit both categories. Thirty hours' worth of work, school, housework, and errands seem to be squeezed into each twenty-four-hour period. Add to the mix holidays and celebrations like Mother's Day, Memorial Day, Father's Day and graduations, and things really start getting busy! As always, we had an enjoyable time last month. Our group consisted of long-time genea-blogger but first-time Scanfester Steve Danko, as well as Bonnie, Colleen, Donna, Sheri, Craig, John, Renee, and Apple. As you can see, we have a couple of non-bloggers, too; all are welcome! We invite all those who are interested in preserving their family's history to join us on Sunday. Source: Midkiff, William Franklin. Photograph. C. 1890. Whereabouts of original photograph unknown. Biography or Information of Interest: The First Frontier District Regiment was much like a home guard or national guard, whose purpose was "keeping out the Indians & arresting deserters and those persons who are avoiding conscriptions and draft services..."
After the war, William returned to his farm at Sivells Bend, Cooke Co., Texas. Later, his family removed to nearby Gainsville. Much of William's story can also be found in Midkiff: A Texas Family, Town and Way of Life. Source: Midkiff, John Rufus, Sr. Reprint of photograph. C. 1890. Original believed to be in the possession of John and Mary Lou Midkiff, Midkiff, Texas, 2004. 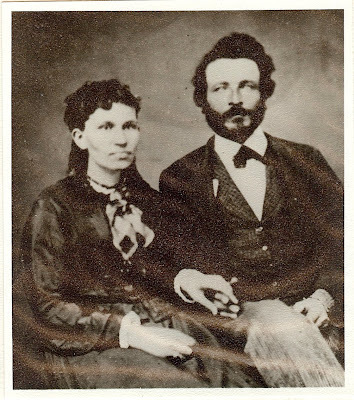 Married: first to Louisa Maria COLE (1839 - 1878) on 2 October 1856 in Lincoln (now Moore) Co., Tennessee. She was the sister to his brother William's wife, Frances. 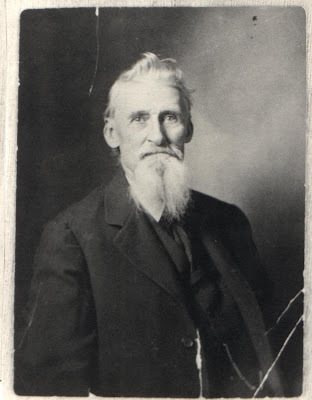 Married second to Judith "Judee" FARMER (c. 1842 - 1892) on 20 June 1878 in Grayson Co., Texas. Source: Compiled Service Record Jacket of J. R. Midkiff. Compiled Service Records of Confederate Soldiers Who Served in Organizations from the State of Texas. National Archives and Records Administration. Publication M323. Digital image purchased at Footnote [http://www.footnote.com/]. Enlisted: with his brother Charles on 5 June 1862 at Whitemound, Grayson Co., Texas in D.W. Baker's Company (Co. A), Hardeman's Cavalry (1st Regiment, Arizona Brigade, 31st Cavalry); private; Transferred 1 December 1863 to Capt. LeKorster's Company (E), 4th Regiment, Arizona Brigade. Biography or Information of Interest: Much of the biography of J.R.'s life can be found in the book Midkiff: A Texas Family, Town, and Way of Life by Mary Lou Midkiff, which traces the stories of J.R. and his son Thomas Oscar Midkiff and their successful attempts to provide a new and good life for their families in West Texas through the hard work of cattle ranching. J.R. had a general store for many years on his ranch in Midland County, which had a little post office with the postmark, Midkiff, Texas. Years later, a new post office with the same name was built not far over the county border in Upton County. You can read more in a post I published last November. A couple of weeks ago, I was contacted by John Goodall, CEO and co-founder of www.hellotree.com. Hellotree is "a free family network for sharing photos and building ...collaborative family tree[s]." It "allows you to invite family members, watch your tree grow across geographies and generations and stay in touch." I've been so busy lately, I really haven't had time to try this out; however, I thought some of my readers may be interested, and perhaps a fellow geneablogger may wish to write a review. Maybe this summer when my time gets freed up, I can play with it a bit more. This week an article was published in the UK newspaper Daily Mail, quoting Ancestors Magazine, under the title: "£200-a-time ancestral DNA test kits are a rip off, say experts", by Andrew Levy. The article was based on tests by the following companies: Oxford Ancestors, Ancestry DNA, and International Biosciences. Family Tree DNA was not contacted for testing purposes, nor mentioned in that article. Having tested over 350,000 individuals (over 100,000 of our direct customers and 250,000 participants in National Geographic's Genographic Project) we could supply anyone who asks us with thousands of examples that prove the opposite of what the article stated. Unfortunately, the journalist's conclusion is based on opportunist companies who noted our success and jumped into Genetic Genealogy to get a piece of it, but who did not have the science or the database that would allow for a serious work. Again, note that Family Tree DNA was NOT one of the companies that the journalist approached. Family Tree DNA is proud to have the largest database of its kind in the world (more than all other companies combined), to adhere to the best science in the field, and to be the expert source for journalists from the New York Times and Los Angeles Times, among others. National Geographic would not tarnish their century-old reputation by partnering with us. You are welcome to share this e-mail with whomever you feel necessary, and we make ourselves available to anyone with questions about our work. Source: Midkiff, Charles Anderson Sr. Photograph. C. 1918. Reprint in the possession of Miriam Robbins Midkiff, Spokane, Washington. 2008. Source: Compiled Service Record Jacket of Charles Midkiff. 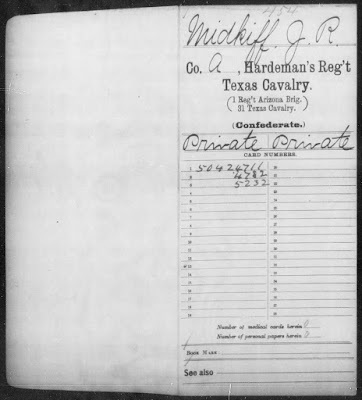 Compiled Service Records of Confederate Soldiers Who Served in Organizations from the State of Texas. National Archives and Records Administration. Publication M323. Digital image purchased at Footnote [http://www.footnote.com/]. Biography or Information of Interest: Orphaned at a young age, Charles was apprenticed as a boy several times, including to John HAMILTON, his sister Ann's husband. As a young man, he followed his brothers and sister Betsey to East Texas, where he met and married his wife Mary. 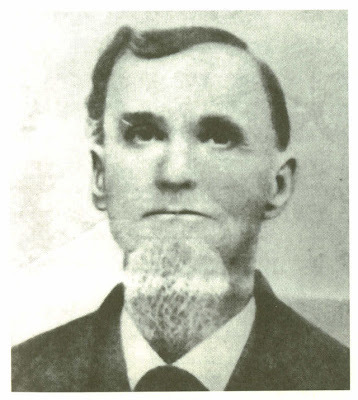 "William Polk Hardeman, a former Texas Ranger, organized the unit [Hardeman's Bridgade] early in the war with the purpose of serving with General Henry Hopkins Sibley in Sibley's proposed Confederate invasion of New Mexico and Arizona. After engagements at Val Verde in February 1862 and Glorietta in March, the First Texas Cavalry returned to their home state. The honorific, "Arizona Brigade," was added to the unit's official designation, even though later enlistees served only within the boundaries of Texas." --from Midkiff: A Texas Family, Town and Way of Life by Mary Lou Midkiff. Midland, Texas: Oleo Publishing. 2005. After the war, they moved to Oklahoma Territory, where several of their children were married and began their families. In the early 1900s, Charles, Mary, and some of their grown children removed to West Colorado, where Charles tried his hand in farming. He was badly injured when a pair of mules ran away with him and he was caught under the wagon, breaking his leg. With the deep winter snow and his crippled leg, he decided to sell the farm around 1913 and removed again with the extended family to Northern California. 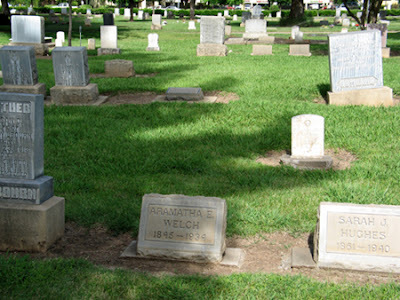 Source: Unmarked grave location of Charles Anderson Midkiff, Sr., Chico Cemetery, Chico, Butte Co., California. Digital photograph taken at the request of Miriam Robbins Midkiff by Find A Grave photo volunteer "Laural N. D." Digital copy in the possession of Miriam Robbins Midkiff, Spokane, Washington. 2006. Buried: 16 September 1919 in Chico Cemetery, Butte Co., California in Wilbourn Family Plot (Garden 12, Section B, Lot 32, Space 10). Grave unmarked. 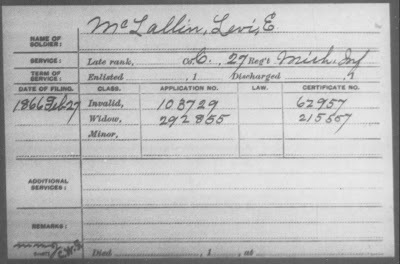 Source: Civil War Pension Index Card of Levi E. McLallin. Organization Index to Pension Files of Veterans Who Served Between 1861 and 1900. National Archives and Records Administration. Publication T289. Digital image purchased at Footnote [http://www.footnote.com/]. 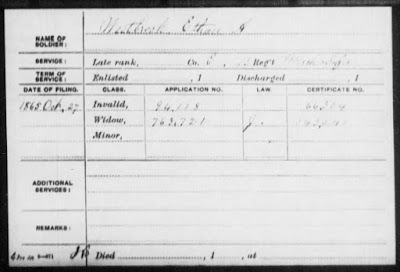 Enlisted: 24 October 1862 in St. Clair, St. Clair Co., Michigan; private. Enlisted 11 November 1862 in Co. C, 27th Michigan Infantry. Promoted to full corporal 18 July 1863. Biography or Information of Interest: This man has been very difficult to research because McCLELLAN can be spelled so many different ways, and when I've found them on censuses, all the names and ages of the children are always a bit "off." He is a recently discovered ancestor, so I have a lot to learn about him, and he and his family have provided me with many research challenges. Levi served in same company as William J. McCLELLAN, who may have been his brother. He also served in the same regiment (but different company) as William Lee MASSEY. Levi's great-grandaughter, Mary Jane BARBER, married William's great-grand-nephew, Howard Merkel YORK 45 years after the end of the Civil War. They were my great-grandparents. Levi's daughter, Cornelia, was married to two different Civil War veterans, who have already been listed in this series: Sylvester FREDENBURG and Washington Foster JUDD. Children: William Henry (1856 - 1934), James Marion (1858 - 1943), Charles Benjamin (1859 - 1934), and Mary Ellen MASSEY (1863 - 1921). 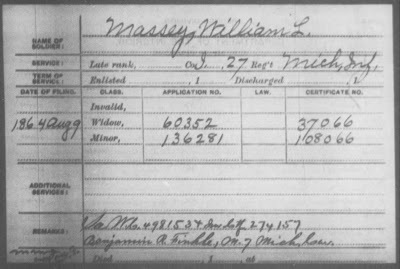 Source: Civil War Pension Index Card of William L. Massey. Organization Index to Pension Files of Veterans Who Served Between 1861 and 1900. National Archives and Records Administration. Publication T289. Digital image purchased at Footnote [http://www.footnote.com/]. Enlisted: 30 November 1863 at Bingham Twp., Clinton Co., Michigan; private. Enlisted in Co. I, 27th Michigan Infantry on 29 December 1863. 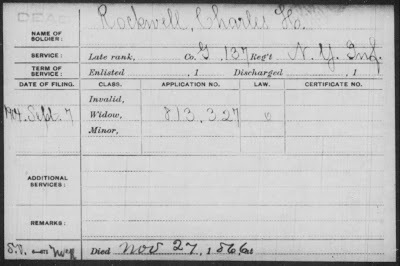 Biography or Information of Interest: Here's another veteran I know very little about, other than he was the younger brother of my 4th-great-grandmother. The Massey family is my one line that hails from south of the Mason-Dixon line, in Maryland. After arriving in Queen Anne County in the mid-1600s, the family remained in the area for seven generations, before William's father Joseph P. MASSEY, relocated to New York by 1810. Died: of disease on 27 May 1864 in Harewood Hospital, Washington, D.C. Source: Tombstone of W.L. Massey, Arlington National Cemetery, Arlington, Arlington Co., Virginia. Digital photograph. 2006. Photographed by Find A Grave photo volunteer "Hope". 2) I have posted the next three biographical sketches of the Civil War Soldiers and Sailors in my husband's and my family trees. I "cheated" and adjusted the post dates so that they will appear on the dates they were originally slated to be posted, even though I wasn't blogging much that week. The posts are of the three Kimball brothers, Benjamin, David, and William. 3) I'd like to publicly thank Jason Felton, a photograph volunteer from Find A Grave, who took the time to go to Maple Grove Cemetery in Fremont, Michigan and photograph the impressive tombstone of my 3rd-great-grandfather, Benjamin Henry Kimball. I had requested this some time ago, and Jason's act of kindness was very timely, allowing me to post the photo on Benjamin's biographical sketch for my Civil War Soldiers and Sailors series. 4) I'd also like to publicly thank Donald Ladd, another Find A Grave photo volunteer, who recently photographed the grave of my 4th-great-grandfather, Ezra Dickinson, another soldier in my Civil War series. I've just added that photo to Ezra's biographical sketch. 5) If you've clicked on any of the links to the histories of the units of my Civil War Soldiers and Sailors for those sketches posted before April 30th, you'll notice that you can no longer view them. I had unwittingly linked to a subscription Civil War website that was offering a trial free-access period during the month of April, and they are no longer available to view for free. The National Parks Service's Civil War Soldiers and Sailors website has free information on the histories of the military units. I'll be changing the links over as time allows. Source: Creston High School, Grand Rapids, Michigan. Photograph. C. 1960. Original in the possession of Faith Valk Robbins, Colville, Washington. 2008. In September, 1959, I entered Creston High School with a student body of nearly 2000 whereas the student body of Riverside Junior High was less than one-third of its size. Everything seemed very confusing to me and my classes were hard, especially geometry. Beth was in my homeroom only (its duration was a mere few minutes) and soon had another best friend. In spite of that, two great things happened that year: I received all A's in gym class merely for suiting up and fulfilling my quota of showers (I was not athletically inclined), and I joined the school choir led by Frank Goodwin. The rules were strict: among them, three dismissals (for not listening, talking, etc.) and you were counted out for the rest of the semester. But he taught us to believe in ourselves. Number one, you are the best! Number two, if you make a mistake, act as if everything is okay. And three, if someone compliments you and you know you messed up, just say thank you. After all, you don't want to be impolite and contradict them. My junior year went much better and I started to make new friends. Then came my senior year and it turned out to be awesome! Beginning the summer of 1961, my family and I went camping near Hart, Michigan to a campground named Silver Lake. I met a young handsome man named Bryan Robbins who was out there camping with his family. (The evening we met happened to be my seventeenth birthday). He asked me to go out in his boat with him the next day which I did and then we walked for several hours over the sand dunes getting acquainted. We shared our views on the political scene and world events. He asked for my address that afternoon just before our family headed for home. 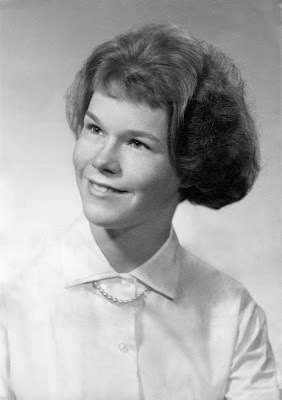 My studies went very well that year, thanks to my physiology teacher--and sponsor of the Senior Honor Society--named Evelyn Ostrander who showed movies to us about study habits for a few weeks before we finally settled down to the subject at hand. That year, I finally made the honor roll which made my parents and myself more than happy. Then there were dates with Bryan every so often and his phone calls. He would turn out to be the love of my life and my future husband. Source: Senior Portrait of Faith L. Valk. Digitally restored photograph. 1961 - 1962. Digital image in the possession of Miriam Robbins Midkiff, Spokane, Washington. 2008. I graduated number 48 in a class of 360 and made plans to attend Grand Rapids Junior College now called G.R. Community College. I would graduate with an Associate of Arts in 1964 and go on to enter what is now called Cornerstone University for one year. My husband and I were married in June 1965. Therefore is the saga of my school years ended. Note from Miriam: Although her step-father attended the University of Michigan, my mother was the first generation in either her mother's or her biological father's direct lines to attend college and obtain a degree. As her biological father had an eighth-grade education, she was also the first generation in her father's direct line to attend and graduate from high school. Both my parents have been--what we call in the education world--life-long learners, and they shared their love of learning with my siblings and me. Our home was always filled with books and music and they set the example for us by always learning new skills. History, art, geography, and science, as well as my heritage and culture, were taught in everyday, ordinary situations. In many ways, they prepared me for my avocation in genealogy. One of these times, I'll ask my father to be a guest blogger as well. I know you'll enjoy his stories as much as you've enjoyed my mother's.